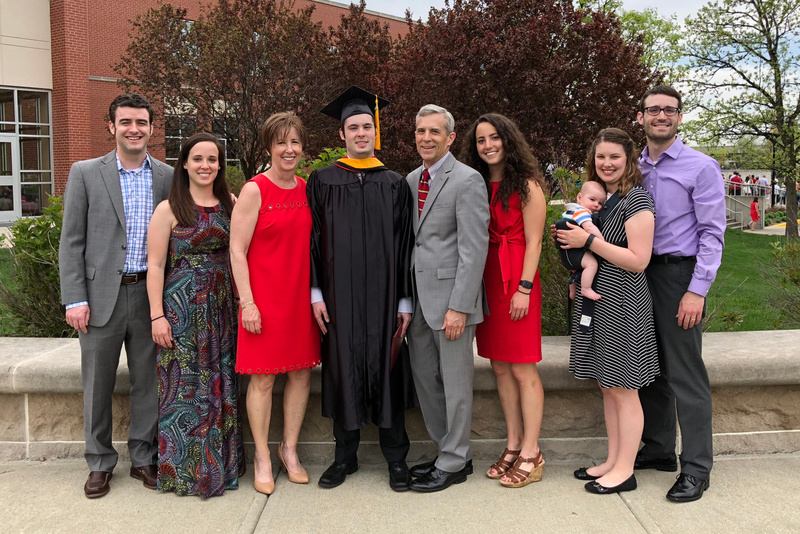 Even though last Sunday's marathon was a big deal to me, we celebrated a much more important event the day before: Kevin's college graduation! I trained for just six months; Kevin has been training for 22 years for this day! I am so proud of his huge accomplishment! Graduation was held at the University of Indianapolis football stadium. Mom and Dad arrived early to save good seats, and we had a great view from the center of the bleachers. The weather was a little toasty, but the passing clouds kept us from overheating. The University gave honorary degrees to a local Methodist reverend and the banjo player Béla Fleck. While the reverend's sermon was well-written and enthusiastically delivered, we all enjoyed the banjo music much more! Conferring the degrees took a long time, and Kevin was one of the last ones to walk across the stage. We were all a bit choked up as he received his diploma. He even remembered to switch the direction of his tassel on the way back to his chair! Congratulations, Kevin! I am so proud of you! P.S. We are excited to celebrate Kelsey's graduation in just a few days! I really like one silly detail of this photo: Kelsey donned her cap and gown to take some family graduation pictures, but she wasn't allowed to switch her tassel yet since she hasn't officially graduated yet!